It’s an amazing honor to receive accolades and achieve recognition for my artwork which I intensely labor over and invest my essence. The announcement of the 2017 American Gem Trade Association (AGTA) Spectrum Awards found me once again thrilled and humbled. My Maple Leaf Earrings won Best Use of Color and my freshwater pearl necklace won Best Use of Pearls. The AGTA, as part of its mission, specifically focuses on the promotion and use of colored gems in the industry so it speaks volumes to me to win the Best Use of Color award. 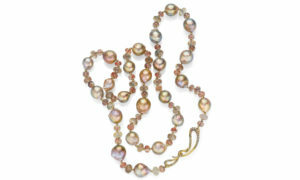 Additionally, I am completely flattered by my pearls taking off as they have. I consider my strongest artistic differentiator to be with my gem carvings and designs but pearls have always stole my heart and I just can’t resist working with them and wearing them as well! In this post I have shared a recent article published by Rapaport via their Diamonds.net publication. Please take a read and also enjoy learning more about some of the other great jewelers and artists that also won awards this year. Tourmalines, sapphires and morganite are among the stars of the AGTA Spectrum Awards for jewelry design. Every year since 1984, the American Gem Trade Association (AGTA) has held its Spectrum Awards to honor the best in colored-gemstone jewelry and cut gems, Colored-gemstone pieces have grown in popularity, and that comes through in the yearly AGTA competition, which has seen a boost in both the number and quality of its entries, according to Douglas K, Hucker, the group’s CEO, with sponsorship from the Platinum Guild International, the Women’s Jewelry Association and bridal media powerhouse The Knot, it is one of the most ambitious and well-regarded design contests in the world, celebrating the variety, beauty and rarity of colored gemstones, gemstone jewelry and pearls, It also salutes the top performers in lapidary art with its Cutting Edge Awards, which debuted in 1991. Read on to discover the passion behind some of this year’s first-place and best-in-category winners.